The Works' Turn is a full-length Plot Point Campaign featuring the aftermath of the climactic battle called "The Harvest." The Reckoners have been banished to the distant living planet of Banshee, but there's no time for celebration. The Iron Alliance has learned a terrifying secret - the Reckoners were keeping other, even older terrors in check. The Worms' Turn contains a full-length campaign, updates on the events of the Wasted West, and numerous Savage Tales that can be inserted into your own tales of wasteland woe. 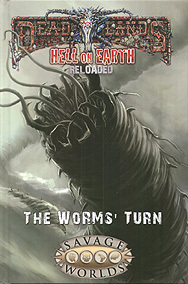 The Worms' Turn requires Hell on Earth for Savage World and the Savage Worlds core book to play. The Hell on Earth Companion is highly recommended as well.